Keeping your car clean on the inside is just as important as washing it regularly. If you want to have the car seats, luggage compartment, ceiling, floor and all indoor areas of your vehicles sanitised and disinfected, call us. Our staff can implement the cleaning of your car upholstery with the most professional and qualitative machines, detergents, solutions, tools and equipment. They use products designated for cleaning upholstery that ensure complete removal of smears, smoke odours, water marks and dirt. We can perform thorough car upholstery cleaning in and near SW5 that will improve the condition of the inside of your vehicle. Our employees can dry clean the leather front and back seats, door areas, ceiling and luggage compartment. For this purpose our staff use diluted cleaning solution soaked in microfibre cloths. Our cleaning technicians remove the larger dirt, food and hair particles using stiff bristled brushes. They vacuum the upholstery with a tool attachment and apply suitable detergents or sprays specialised for stain and spillage removal and leave them for some time. Give us a call or use our online form to schedule your car upholstery cleaning provided within Earls Court, SW5 at affordable rates. Our staff hoover the moisture from the fabric and implement steam cleaning whenever it is necessary. It is followed by drying of the upholstery with advanced industrial driers. The cleaning procedures are repeated as many times as necessary until the dirt, stains, darkening and grime are completely removed. 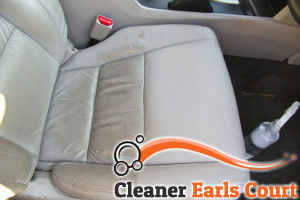 We deodorise the already cleaned car upholstery and interior to refresh it and make it ready to be used. 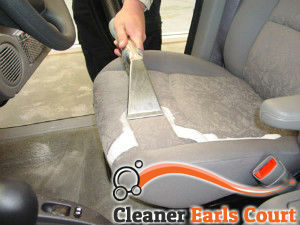 Our car upholstery cleaning services can be used by the Earls Court residents any day of the week.